For other places called Joachimsthal, see Joachimsthal (disambiguation). Jáchymov (Czech pronunciation: [ˈjaːxɪmof]), until 1945 known by its German name of Sankt Joachimsthal or Joachimsthal (meaning "Saint Joachim's Valley"; German: Thal, or Tal in modern orthography) is a spa town in the Karlovy Vary Region of Bohemia, now part of the Czech Republic. It is situated at an altitude of 733 m (2,405 ft) above sea level in the eponymous St. Joachim's valley in the Ore Mountains, close to the Czech border with Germany. The town was mostly German-speaking until the end of the Second World War. In 1938, it was annexed by Germany as part of the Sudetenland. The German-speaking population was expelled in 1945 and replaced by Czech-speaking settlers. The silver Joachimsthaler coins minted there since the 16th century became known in German as Thaler for short, which via the Dutch daalder or daler is the origin of the English word "dollar". At the beginning of the 16th century, silver was found in the area of Joachimsthal. The village of Joachimsthal was founded in 1516 in place of the former abandoned village of Konradsgrun in order to facilitate the exploitation of this valuable resource. The silver caused the population to grow rapidly, and made the Counts von Schlick, whose possessions included the town, one of the richest noble families in Bohemia. The Schlicks had coins minted, which were called Joachimsthalers. They gave their name to the Thaler and the dollar. The fame of Joachimsthal for its ore mining and smelting works attracted the scientific attention of the doctor Georg Bauer (better known by the Latin form of his name, Georgius Agricola) in the late 1520s, who based his pioneering metallurgical studies on his observations made here. In 1523, the Protestant Reformation began. In the Schmalkaldic War (1546–47) Joachimsthal was occupied for a time by Saxon troops. When in 1621 the Counter-reformation and re-Catholicisation took effect in the town, many Protestant citizens and people from the mountains migrated to nearby Saxony. 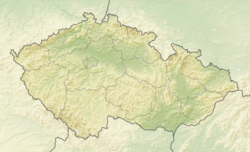 Until 1918, the town (named Joachimsthal before 1898) was in the Austrian part of the Dual Monarchy of Austria-Hungary, head of the district with the same name, one of the 94 Bezirkshauptmannschaften in Bohemia. In the 19th century the town was also the location of a Court, and of an administrative office responsible for mines and iron production. Mining was still significant in this period. It was run partly by state-owned and partly by privately owned firms. In addition to silver ore (of which in 1885 227 zentners [11.35 tonnes] were produced), nickel, bismuth and uranium ore were also extracted. There were also other industries: an enormous tobacco factory employed 1,000 women. In addition, there was the manufacture of gloves and corks and of bobbin lace. On 31 March 1873 the town almost entirely burnt down. At the end of the 19th century, Marie Curie discovered, in tons of pitchblende ore containing uraninite from Joachimsthal, the element radium, for which she won the Nobel Prize in Chemistry. Until the First World War this was the foremost source of radium in the world. The first radon spa in the world was founded in Joachimsthal in 1906, joining the famous spas of the region, including Karlsbad, Franzensbad, and Marienbad. In 1929, Dr Löwy of Prague established that "mysterious emanations" in the mine led to a form of cancer. Ventilation and watering measures were introduced, miners were given higher pay and longer vacations, but death rates remained high. In 1938, it was annexed by Germany as one of the municipalities in Sudetenland. The German-speaking population was expelled in 1945 (see the Beneš decrees) and replaced by Czech settlers. After the Communist party took control of Czechoslovakia in 1948, large prison camps were established in the town and around it. Opponents of the new regime were forced to mine uranium ore under very harsh conditions: the average life expectancy in Jáchymov at this period was 42 years. Uranium mining ceased in 1964. The radioactive thermal springs which arise in the former uranium mine are used under the supervision of doctors for the treatment of patients with nervous and rheumatic disorders. They make use of the constantly produced radioactive gas radon (222Rn) dissolved in the water, see Radon therapy. Not far from here, at the foot of the Plešivec, there once stood the Capuchin monastery Mariasorg (Mariánská); it was razed to the ground in the 1950s. From the valley of the Veseřice a chairlift goes to the highest peak in the Ore Mountains, the 1244 m high Klínovec. Georgius Agricola (1494–1555), town doctor and chemist, the "Father of Mineralogy"
^ See also dollar at Wiktionary. ^ Heinrich, E. Wm. (1958). Mineralogy and Geology of Radioactive Raw Materials. New York: McGraw-Hill Book Company, Inc. p. 283. ^ Wiskemann, Elizabeth (1938). Czechs and Germans. This page was last edited on 22 March 2019, at 23:03 (UTC).